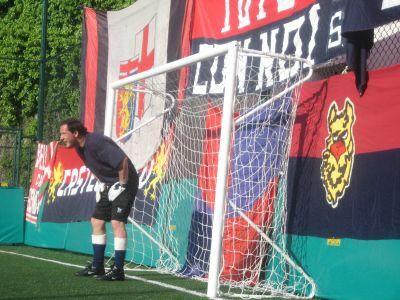 Because of the 10th anniversary of Genoa Club Amsterdam, Luca Carini and his friends of Genoa Club Castelletto organized a fantastic football tournament near the lighthouse of Genova: 1st edition: “United in the name of Genoa”. 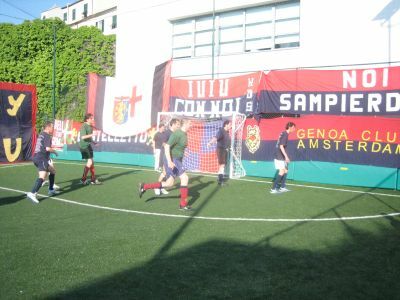 Besides these 2 teams also AllBlacks from Fucecchio in Toscany and 3 other teams of Genoa-fans: Noi di Sampierdarena, Only You and Grifoni Cromati played in the fantastic and very friendly tournament without any injuries or yellow and red cards. 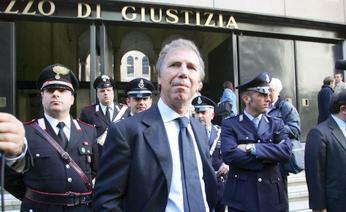 Unless the fact that Genoa Club Amsterdam was helped with players of B.F.C. 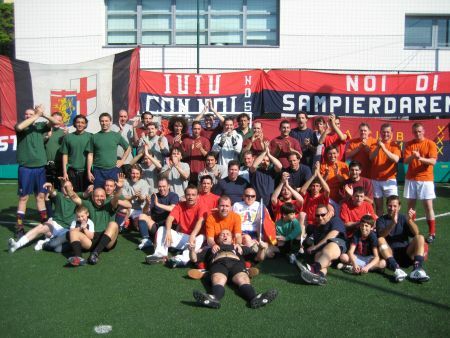 (Bussumse Football Club), beautiful orange shirts by the organisation of the tournament and a fantastic ball with the signature of all players of Genoa (thanks Dino !) 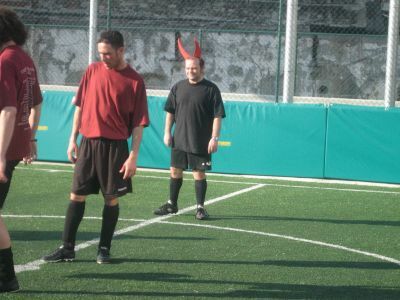 the Orange Griffins did not reach the final in which Grifoni Cromati beat the favorite AllBlacks by 3-2. Surely we come back next year with some presents to please top-referee Piero to win the 2nd edition of this great tournament: “United in the name of Genoa”. 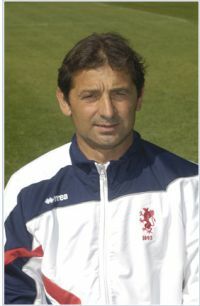 At the end of a fantastic weekend the Dutch Genoani saw a bad Genoa loosing against the very inspired team of Empoli. Of course Empoli has to do everything to stay in Serie A and Genoa is save on the 8th position, but till yesterday there was still a little hope to reach the 7th position which probably gives the possibility to play in Uefa-cup next season. After the deserved defeat we only can hope that Genoa stays on the 8th position and maybe reach Uefa-cup by winning in the Intertoto-competition, while it is not sure that Gasperini and his players want to play in this summer competition. 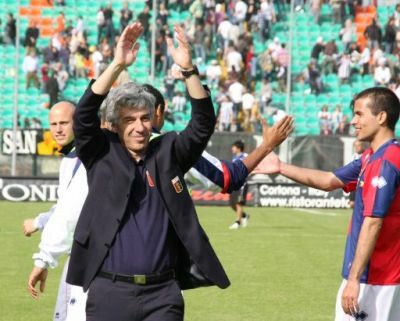 In the last 11 matches Siena lost only 1 time and Genoa played after the red card of Gaetano de Rosa in the 34th minute with only 10 players, but the Gasperini-boys again booked a victory! With De Rosa in defense, Konko and Juric in midfield to substitute playmaker Milanetto and Danilo on the position of Fabiano the red and blue started the match in stadium Artemio Franchi that was filled with 12.000 supporters: 8.000 of Siena and 4.000 Grifoni. In the 24th minute a cross of Sculli was controlled by Konko who shot just inside the penaltyarea with his right foot in the corner of the goal: 0-1. Only 10 minutes after the goal an error of Rubinho gave Maccarone the opportunity to score the equalizer, but Gaetano de Rosa blocked him and got a red card of the referee. Of course Siena did everything to score the equalizer in the rest of the match, but Rubinho and the others did fight like lions and defended the 0-1 advantage till the end. The fifth victory of Genoa outside Marassi, curiously just like the present 4 times in the red and blue homeshirt! Genoa now is only 3 points behind Udinese and close to Uefa-zone. After the undeserved lost match in Rome 2 weeks ago the European dream of Genoa seemed over, but after the fantastic 3-0 victory last week against Torino and the defeats of Udinese and Sampdoria the hope to play in UEFA-cup next year returned. If Inter and Roma play the final of the Coppa Italia (both are in the semifinals) number 7 of the standings also plays in UEFA-cup and number 8 can play in the Intertoto-tournament. At the moment Genoa is the number 8 in the standings 6 points below number 7 Udinese that plays against number 6 Sampdoria tomorrow, which means that a victory of Genoa in Siena in front of nearly 4000 Genoa-fans that travel 307 kilometers to Toscany automaticly brings the Gasperini-boys closer to UEFA-cup zone. Saturdayafternoon 26th April the futsal-team of B.F.C. 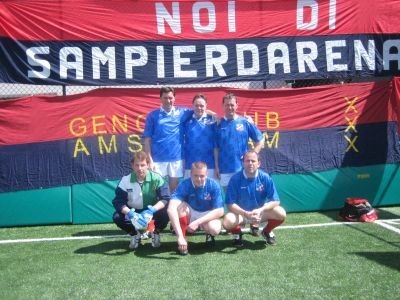 with several members of Genoa Club Amsterdam plays an international 6 x 6 tournament in Genova. The happening is organized by our member of honour Luca Carini and takes place in Via Ariberto Albertazzi which is close to the famous lighthouse of Genova. Six teams are present on the tournament: AllBlacks (from Fucecchio in Toscany), Castelletto, Noi di Sampierdarena, Only You, Grifoni Cromati and Amsterdam. We hope press-manager Dino Storace and some players of Genoa CFC visit the tournament to handover the trophies and to start the, most important, 3rd half. Of course everybody is welcome to support us ! Genoa was 90 minutes the best team in the field, but we had to wait for the goals till the second half. With the expected line-up (Rubinho; Lucarelli, Bovo, Criscito; Rossi, Konko, Milanetto, Fabiano; Sculli, Borriello, Leon) in the usual 3-4-3 system Genoa played very offensive from the first minute. At halftime today’s coach Bruno Caneo substituted Fabiano by Di Vaio, who scored after only 6 minutes the first goal of the match. 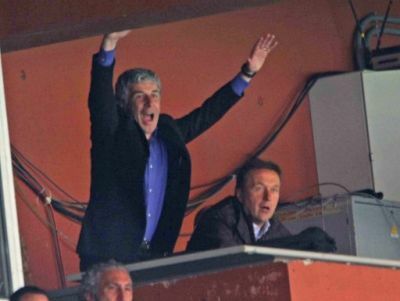 The happiness of the banned Mr. Gasperini was clear. Exactly 10 minutes later Marco Borriello doubled the score into 2-0, which means already his 19th goal this season in Serie A. In the 69th minute Giuseppe Sculli brought the final score on the board: 3-0. With 45 points Genoa is now 5 playrounds before the end of the season 15 points ahead of number 18 in the standings, which means that it is 99,99% sure we play also next year in Serie A.